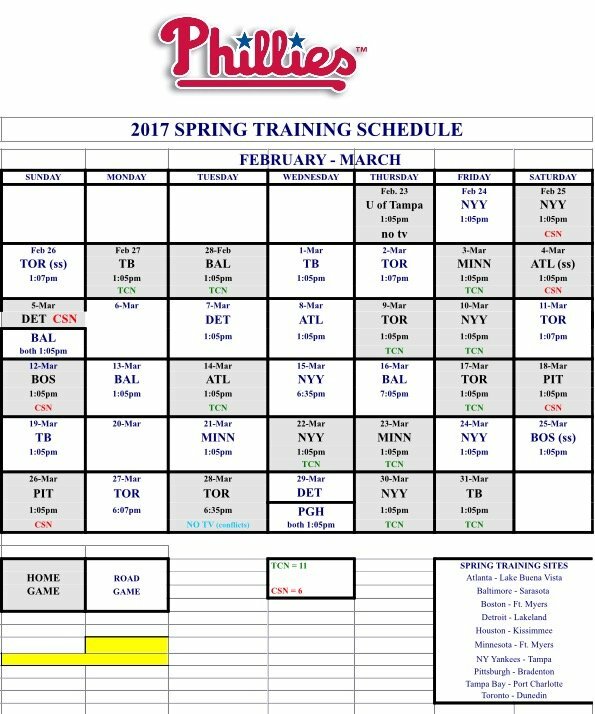 The Phillies will open their 2017 spring training schedule on Feb. 23 against the University of Tampa, a day before traveling to Tampa to face the Yankees in the first of a two-day home-and-home series against New York. Phillies fans will get their first opportunity to watch the team on TV on Feb. 25, in the second game of the back-to-backs against the Yankees. That game will be broadcast on CSN at 1:05 p.m. The Phillies return to your TV screens on Saturday, Feb. 25, when they'll host the Yankees in Clearwater, Fla. Comcast SportsNet is broadcasting 17 of the Phillies exhibition games this spring. Comcast SportsNet officially announced on Monday that popular former Phillies first baseman John Kruk will join the network as a color analyst for the 2017 season, working alongside play-by-play man Tom McCarthy, fellow analysts Mike Schmidt and Ben Davis, and reporter Gregg Murphy. Kruk is expected to split the bulk of the color analyst work with Davis, similar to the setup Davis and Matt Stairs have had in the last two seasons. Stairs' place on the broadcast team opened up when he was hired as the Phillies hitting coach in early November. Schmidt, meanwhile, works as a second analyst in the booth for home weekend games. Kruk, 55, hit .309 with a .400 OBP and 62 home runs in six seasons with the Phillies from 1989-94. He represented the team in the All-Star Game for three straight years (91-93) and was inducted into the Phillies Wall of Fame in 2011. Kruk spent the last 13 seasons working with ESPN before parting ways with the network in October. He’ll make his debut in the Phillies booth on Feb. 25 against the Yankees.